I reviewed Blue Microphones' first entry into the headphone market, the $349 Mo-Fi, in November 2014. Since then the Mo-Fi has continued to garner favorable press, but there were several areas where I felt the Mo-Fi could have been improved. My principal complaints were that the Mo-Fi was heavy and the built-in "active mode" amplification was noisy and did not add to (and actually detracted from) the headphone's overall fidelity. Flash forward to 2016 and Blue's newest headphone offering, the $249 Lola. Like the MoFi, the Lola has a unique set of attributes that should appeal to anyone who is looking for a pair of rugged, multi-purpose, closed-cup headphones. The Lola is a sealed-cup, over-ear design that does a good job of isolating you from the outer world. Handclaps turned into dull thuds when the Lolas were on my head. The Lola headband is made of metal and employs a spring tension system. The Lola also uses a unique height adjustment scheme where you push down on the headband to position the earpads exactly around your ears. This headband design isn't new--it's very similar to the design that Blue used on the Mo-Fi headphones, except the Lola's designers managed to reduce the overall weight of the headband (eliminating the Mo-Fi's electronics probably helped). The Lola headphone has some of the thickest, softest earpads I've experienced on any headphone. They are soft enough so that, even if you wear glasses, they will form a tight seal around your ears. Besides the thick earpads the Lola also has a thick pad at the top of the headband, which takes the top pressure and places it into a well-padded three- by one-inch space. While I found the Lola cushion arrangement to be very comfortable, if you are devoid of hair up top and it's a warm day, you might find the warm leatherette top cushion less to your liking. One difference between the Lola headband and the original Mo-Fi headband is the elimination of the Tension adjustment. The top of the Mo-Fi's headband has a circular knob that adjusts side-force tension. On the Mo-Fi I found very little difference in the tension from one extreme to the other. By removing the tension adjustment, nothing was lost in my opinion, and some weight was shed in the process. Inside, the Lola uses a 50mm-diameter fiber-reinforced dynamic driver with 42-ohm impedance and a published frequency response of 15 Hz to 20 kHz. Blue doesn't list a sensitivity specification, but I found the Lola to be somewhat less sensitive than the Oppo PM-1 headphones and much more sensitive than HiFiMan's HE-560 headphones. The Lola headphone comes with two cables: a three-meter and a 1.2-meter. The 1.2-meter cable has built-in iPhone/iPad volume and mute controls. The cables attach to the Lola via a long barrel connection that connects firmly yet will quickly disconnect if pulled. The Lola also comes with a soft case with a cable storage pocket, a one-meter USB charging cable, an AC charger, a 3.4mm-to-0.25-inch adapter, a user manual, and registration materials. If you're the sort of person who likes to dance to the music and who regularly finds themselves with a shaken off a pair of headphones lying on the ground or slumped around your ears, the Blue Lola could well be your ideal headphone. Of all the headphones I've reviewed over the years, the Lola (and the Mo-Fi) are certainly among the most tenacious (yet comfortable) fit I've experienced. Especially for recording musicians who can't deal with a pair of cans that slip from the right position (they always slip just before a solo), the Lola could be just what a sight-reader ordered. I tried, I mean really tried, to shake off my review pair of Lolas; but, no matter how much I tried (short of giving myself a concussion), I failed to dislodge them. While on the subject of recording studios, here's a dirty little secret I'll share with you--eventually any headphone used in a recording studio will be thrown. I've done it, and I've seen lots of other musicians toss their cans. The Lola will survive any toss short of a Cy Young winner five feet from a brick wall. The only downside of Lola's heavy-duty build is that the headphones weigh just 14 ounces and don't fold up into a compact portable package. If you plan to travel with the Lola headphones, you may need to move up to a larger knapsack or briefcase. Another feature that everyone will appreciate both in and out of the studio is the Lola's removable cable system. The headphone end of the attachment system employs a long metal ferule that fits snugly into the left-hand Lola cup. It's firmly attached, but anything more than a gentle pull will disengage it from the headphones. That's a good thing. Also, the inclusion of two cables of different lengths, one for portable devices and the longer one for studio or home, is the sort of feature that shows that Lola's designers were doing their homework. Since Blue chose a nice standard connector, you can also use third-party cables. I used a one-meter length of Wireworld Nano-platinum Eclipse cable with the Lola for much of my in-home listening. Sonically, the Lola headphones are good enough to put them on par with some very fine competitors. The Lola produces a harmonic character that favors bass but still has enough high-frequency sparkle to avoid sounding dark or closed in. Given the sealed-enclosure design, the Lola headphones have a decent-sized soundstage that is very similar in scope to the Mr. Speakers Alpha Dogs but not quite as extended as the new Alpha Primes. Imaging through the Lolas is also good, but not quite as precise as the Oppo PM-1 or Alpha Dog Primes. In terms of low-level resolution, I would say the Lola has similar detail resolution as the Oppo PM-3 headphones. The Lola's isolation from outside noise was excellent for a full-sized headphone, and although the Lola does not reduce outside noise as much as an in-ear monitor like the Etymotic ER-4, the Lola certainly can be used in environments where an open-backed headphone would pass along way too much outside noise. Also, if you're looking for a full-sized headphone that could be used in a studio-recording situation where you need to reduce bleed from the headphones sneaking back into the mix, the Lola would be a perfect choice. • The Lola headphones are rugged. • The Lola headphones have a removable cable. • The Lola's fit is among the best for eyeglass wearers. • The Lola headphones are heavy. • The Lola headphones do not fold into a small package. • For those with a large head, the side pressure may be excessive. For $249 you can buy some very good headphones, including offerings from most of the major headphone manufacturers. Beyer Dynamic makes several excellent headphones in this price range, including the DT990, DT880, and DT1350. 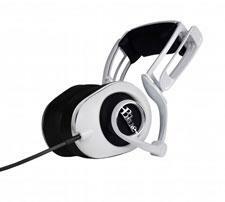 Sennheiser's Momentum is a closed-back, high-sensitivity design that is both comfortable and high resolution. Sony's MDR1 is also a sealed-enclosure design that is very highly rated. Audio-Technica's ATH-A500x is another closed-cup design that competes with the Lola and, for those who demand a lightweight pair of headphones, might be a better option. The list could continue for several more paragraphs--for $250 to $300, you have a plethora of excellent headphone purchasing options. The ideal customer for the Blue Lola headphones would be someone who has proven to be "hard" on headphones and must have a pair with superior isolation. The Lola's all-metal headband will survive far longer in hostile environments (like recording studios) than a pair of Stax headphones, for instance. The Lola should also appeal to anyone who needs a pair of headphones that will remain in place no matter how much head shaking or body english they employ while listening (or making) music. Although the Blue Mo-Fi was a fine first offering, the new Lola headphones are not only a better value for $100 less, but they maintain the Mo-Fi's best features while eliminating the Mo-Fi's weakest performance area. If you almost bought a pair of Mo-Fi headphones but didn't need the active modes, the Lola could be the perfect headphone for you. • Blue Microphones Mo-Fi Over-the-Ear Headphones Reviewed at HomeTheaterReview.com.